Craig asks if Constans II ever defeated the Arabs in pitched battle, and- if he hadn’t been killed in his bath- would he have completed the conquest of the Duchy of Benevento. Constans II took the throne when he was 11 so the early victories of his reign- the brief reconquest of Alexandria and several naval battles- can’t really be credited to him. But he was a quick learner and a talented general. At the age of 21 he personally led the eastern army into Armenia and drove the Arabs out. Five years later they were back and he repeated the feat in a quick campaign. By this time the Arab world was in the midst of a civil war and the worried Caliph bought a treaty with the promise of 1,000 gold pieces, a horse, and a slave for each day that Byzantium kept the peace. Constans took the breathing room to reorganize his army and consolidate the weakened provinces. His most immediate concern was money. The imperial army had a serious morale problem. It showed a disturbing tendency to disintegrate in the east and revolt in the west- largely because its pay was so far in arrears. To fix the problem Constans had to control North Africa- where most of the surplus revenue came from- and that meant moving his center of operations closer to the threatened province. He transferred the government from Constantinople to Syracuse in Sicily and started to build up an army. It wasn’t a popular move, but the emperor was determined. No less than three full-blown revolts broke out- one involving virtually the entire eastern army allied with the Caliphate and marching on Constantinople- but Constans refused to budge. Ultimately of course, this resulted in his embarrassing assassination. But if he had avoided that fatal bath would he have conquered the Duchy of Benevento? I don’t think so. His primary concern was with Africa. He attacked Benevento when he reached Italy for two reasons- to dissuade the Lombards from attacking him and to keep the surrounding Italians loyal. He had done much the same against the Slavs in the Balkans- successfully weakening them to neutralize a threat instead of outright conquest. The man had a sensible plan and may even have had the skills to carry it out. (more about that here) Unfortunately, thanks to a soap dish, unfairly high taxes, and a disgruntled chamberlain, he never had the chance to carry it out. If Basil I was illiterate how good could Byzantine education be? Nick asks how good the Byzantine educational system really was if the founder (Basil I) of its most illustrious dynasty was illiterate. The average literacy rate for Byzantium probably averaged around 30%- which may not seem particularly high by contemporary standards, but for comparison’s sake is higher than 18th century France. Of course there were the inevitable ups and downs- the 7th and 8th centuries are known as the ‘Byzantine dark ages’ where the literacy rate probably plunged well below 30%- but on the whole imperial subjects were better educated than their western brethren. The fact that several emperors (Basil I and Justin I) were illiterate is not surprising considering the class they came from. They were both peasants (a swineherd and a shepherd), and as such had little time or money for school. Once they gained the throne, however, they made sure their successors had the finest education available- and the remarkable thing is just how good that education was. Justin was followed by Justinian and Basil by Leo the Wise, both famous for their scholarship and considered among the most erudite of rulers. The fact that a good education was available was due in large part to the excellent university of Constantinople. When it was founded in the 5th century it had 31 chairs: 10 each for Greek and Latin grammar, 2 for law, 1 for philosophy and 8 for rhetoric. It was underwritten by the state and provided instant access to education for both genders of the nobility- during the latter half of the Macedonian Dynasty literacy among the aristocratic class probably was nearly universal. The middle classes could also expect a practical education. Byzantine clerks, notaries, and accountants had several years of training and government officials could measure land with a small margin of error. Workmen routinely constructed items which were considered miraculous in the west- Thophilus’ famous elevated throne and golden lions that roared, a 9th century system of fire beacons that relied on synchronized clocks, buildings like the Hagia Sophia, aqueducts, silks, glass, and ceramics, as well as the famous silk industry. None of this would have been possible without a widespread specialized education. The real question is how much the poor had access to any of this. The University of Constantinople was funded by the state even through the troubled ‘dark age’, but the vast majority of the imperial citizens lived outside the capital. In fact the lack of education in the countryside became somewhat of an issue for the imperial government. In their law codes both Leo VI and Justinian complain about the woeful state of ‘knowledge’ among peasants, and they authorized wills to be witnessed by ‘ignorant’ people if a literate one couldn’t be found. In 867 Basil I (who could certainly sympathize) ordered that fiscal documents should write out the fractions to be more easily understood by peasants. It’s tempting to think that the poor were all uneducated- and the vast majority of them most likely were- but there are a few hints that this might not be universally so. Saints’ lives- which were popular throughout imperial history- frequently mention in passing the schooling that even impoverished holy men received before entering the church. In addition, important imperial proclamations were posted in public (implying that someone could read them) and archeological sites have turned up thousands of stone slabs, wooden tablets, potsherds, and papyri, covered by inscriptions, signatures, transactions, accounts and contracts. These combined with the inevitable graffiti that appeared on public walls down through the centuries testifies to the essential role of writing- even during the dark times- in Byzantine daily life. The illiteracy of Basil I (and Justin) was seen as embarrassing by the court- and was considered rare enough that it needed to be pointed out. Basil’s great grandson Constantine VII (a prolific author in his own right) went to great lengths to excuse his ancestor’s intellectual inadequacies, while making sure his offspring didn’t share it. In the end, if Basil’s illiteracy represents a failure of the Byzantine educational system, by its very rarity it also brings into sharp relief how many times that same system succeeded. Did Byzantium persecute the Jews? Listener Stuart asks what Byzantium’s policy was concerning the Jews. There are two things that make this a difficult question to answer. The first is that the exact imperial policy tended to change depending on who the emperor was, and the second is that from the vantage point of the twenty-first century medieval attitudes toward Judaism- even the most “enlightened”- can look pretty barbaric. Generally speaking, however, we can say that Jews were more accepted in the Byzantine Empire than in the West. There were the occasional hostilities, but no systematic persecutions or mass expulsions like those common in Western Europe at the time. Theodosius I officially recognized Judaism as a lawful religion, but forbade intermarriage with Christians and barred Jews from the civil service and the military. Theodosius II extended the ban to all public offices both civilian and military- with the notable exception of the office of decurion (tax collectors). Jews who circumcised non-Jews were exiled, and conversion to Judaism was technically illegal (although apostate Jews were allowed to leave Christianity for their former faith). They were also allowed to own Christian slaves- and pass them to their children- but not to purchase new ones. Justinian (trying to eradicate all religious divisions- including heretics, pagans, and Jews) banned the construction of any new synagogues and ordered all existing ones to be converted to churches. These draconian measures, however, had little real effect. There is only one recorded instance of this (sort of) happening – in North Africa a synagogue on the Berber frontier was converted to a barracks for military reasons- and archaeological evidence suggests that these official decrees had little sway over synagogue building in Palestine. This gap between instructions coming out of Constantinople and follow-through in the territories was probably true through most of imperial history. The fact that Justinian felt the need to specifically forbid Jews from holding public office- a law which had already been on the books for over two centuries- suggests that the imperial edicts were either unenforced or unenforceable. This kind of de jure restriction and de facto toleration didn’t inspire much loyalty from Byzantine Jews. In 556 there were riots in Caesarea serious enough to kill the governor, in 608 the Patriarch of Antioch was seized and dragged through the streets by the local Jewish population, and in 614 the Jews of Jerusalem sided with the invading Persians and participated in the wholesale slaughter of their Christian neighbors. When a Jewish leader was asked why he had participated he responded with the answer: ‘because these Christians are the enemies of my faith’. Clearly the ill-will cut both ways. Despite these occasional outbursts on both sides, the centuries after Justinian were characterized by marked toleration- probably because the empire was fighting for its life. In the six hundred years between the reigns of Justin II (565) and Alexius IV Angelus (1204) there were only four exceptions. 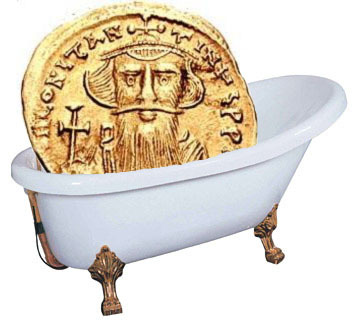 Heraclius ordered the forced baptism of all Jews in the empire, as did Leo III, Basil I, and John Tzimiskes. Together they made up about 50 years of official “persecution” although by all accounts there was virtually no attempt to actually enforce it other than a few symbolic acts. In fact, Jewish ancestry doesn’t seem to have been particularly troublesome for a man on the rise. One 9th century Byzantine Emperor (Michael II) had Jewish grandparents and grew up in a mixed household that retained many Jewish customs. Though called the “Amorian” (ie from the city of Amorium) he was the probable ancestor of the Leo the Wise and was therefore the true founder of the Macedonian Dynasty- the most brilliant family that the empire ever produced. 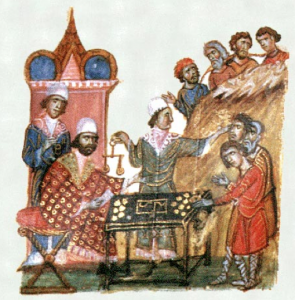 By 1176, the rabbi and traveler Benjamin of Tudela reported that there were about 2,500 Jews living in Constantinople, most involved in manufacturing silk or other mercantile activities. They were restricted to the Pera quarter of the city, but were generally treated with respect. Quite a few of them were wealthy and one even served as the current emperor’s personal physician. The fourth Crusade was a catastrophe for Jews and Orthodox alike, but the Byzantine reconquest of the city in 1261 was a particular boon to the Jewish community. The emperors Michael VIII and his son Andronicus II were even condemned by the Patriarch of Alexandria for their “excessive toleration of the Jews”- probably because they didn’t enforce ghettoization and allowed Jews to live among Christians. By the 14th century the empire was in an advanced state of decay and forced to give foreigners- particularly Venetians- special privileges. Many of the remaining Jews in Constantinople purchased Venetian citizenship and benefited from a more favorable tax structure and greater trading rights. Ironically enough for an empire that had at one time attempted to convert its Jewish population, by 1453 the Jews in Constantinople probably had a broader set of rights than their Christian neighbors. Of course that was only by virtue of their Venetian citizenship, but as any of their ancestors could have pointed out, much better to have rights for the wrong reasons than to have no rights at all. 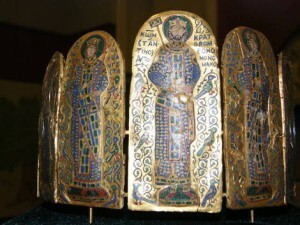 What happened to the Byzantine Crown Jewels? Listener Shane asked what happened to the Byzantine crown jewels. Their story is a sad allegory of the empire itself. They were pawned to Venice in 1343 by the empress Anna of Savoy, who was in the middle of a civil war and desperately needed the money. Her son tried to recover the crown (the replacement diadem was a shoddy job of cut glass and gilded leather), but was hopelessly short of funds. Venice had paid 30,000 ducats- twice what the entire city of Constantinople brought in per year- and there was no way he could raise the amount. On a trip through Europe to drum up support against the Ottomans in 1369, John made the mistake of visiting Venice where he was humiliatingly detained for two years as a debtor. In 1376 he managed to work out a deal for an installment plan where the crown would be returned as a show of good faith after the first payment. Unfortunately, a month later his son overthrew him and Venice refused to send the crown to a usurper. Successive emperors never quite gave up hope- imperial ambassadors officially brought it up in 1390, 1406, 1418, 1423, 1442, and 1448- but Venice preferred to keep it safely locked up in St. Marks as a bargaining tool. It remained there until 1797 when the Republic of Venice fell to the French. Napoleon thoroughly looted the treasury- leaving behind only the current 283 pieces- and the forgotten crown’s ultimate fate was most likely to be melted down to fund the dictator’s numerous wars. There is, however, a brighter postscript. Byzantine history is long and there were many crowns. Emperor Michael VII (1074) gave one to the Hungarian King Géza I which is now kept in the Central Hall of the Hungarian Parliament Building. 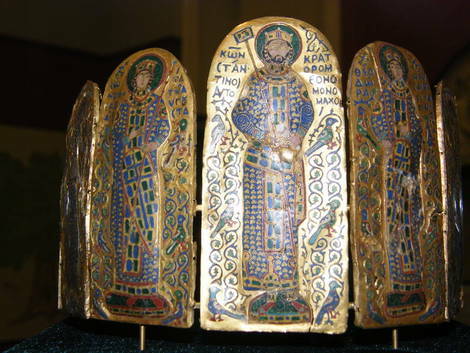 Emperor Constantine IX Monomachus (circa 1042- that’s his at the top) wore another of decorated enameled plates, which can be seen in Budapest. The most prestigious one, however, is undoubtedly the crown of the great Nicephorus Phocas (circa 963), kept today along with his imperial vestments in a monastery on Mt. Athos. What are the sources for Belisarius? Listener Steve asked what (excluding Procopius) are the sources- Byzantine or otherwise- for the life and career of Belisarius? The good news is that there were a lot of historians and chroniclers active during Belisarius’ lifetime, and most of them were aware that they were living through significant times. Procopius stopped writing in 552 and was continued by Agathias Scholasticus till the year 588. He was in turn followed by a man named Menander Protector who decided to write history after he had blown his life savings having a good time. This was evidently a smart career choice as Menander was soon joined by a crowd of writers. If you fancied Justinian’s reign you could pick up bestsellers from Evagrius, John of Epiphaneia, John Malalas, and Marcellinus Comes. The bad news, however, is that most of these are only partially translated today- or worse exist only in fragments. Unless you know someone at Dumbarton Oaks, you’re probably not going to be able to read them anytime soon. The only commercially available, non-Procopius source is Jordanes. He was a 6th century Roman bureaucrat who had a book collection and the rare gift (as he put it) of being concise. A friend who wanted to read a history of the Goths asked to borrow a copy of Cassiodorus’ (now lost) work, but when he saw its size (12 volumes) he asked Jordanes to sum it up for him. The result is the Getica, which concludes with Belisarius’ brilliant defeat of the Goths in 540. 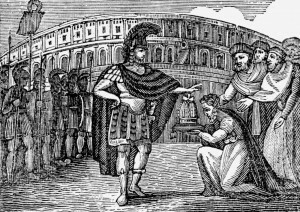 What’s the best book about Belisarius? 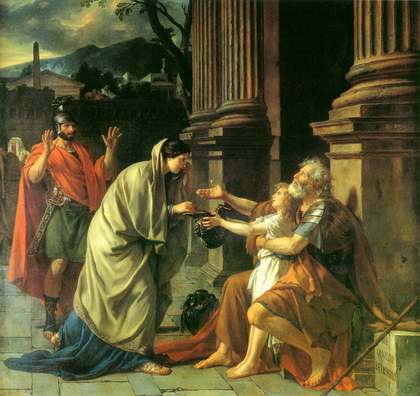 Listener Gary asks which of the few books on Belisarius are the best. My favorite is the classic one by Lord Mahon (Philip Henry Stanhope) called ‘The Life of Belisarius’. Originally published in 1829, it’s a bit outdated (it continues the myth of Belisarius’ blinding), but remains the standard if only for want of a serious rival. If you prefer a more modern perspective there is Ian Hughes’ 2009 ‘Belisarius: The Last Roman General’, and if you don’t mind a touch of historical fiction, there is Robert Graves’ (author of ‘I Claudius’) very entertaining- and generally historically accurate- version called ‘Count Belisarius’. Listener William asked who the Varangians were and why they figured so prominently in Byzantine military affairs. 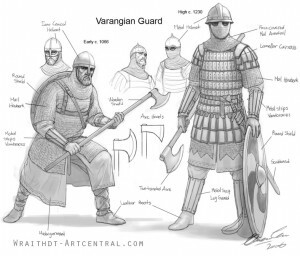 The Varangians were the elite forces of the Byzantine army- much like the Praetorian Guard of ancient Rome or the Ottoman Janissaries. They were originally made up exclusively of Vikings (which the empire had been hiring as mercenaries since the 9th century), but after the Norman Conquest of England a rush of exiled Anglo-Saxons were added to the mix. 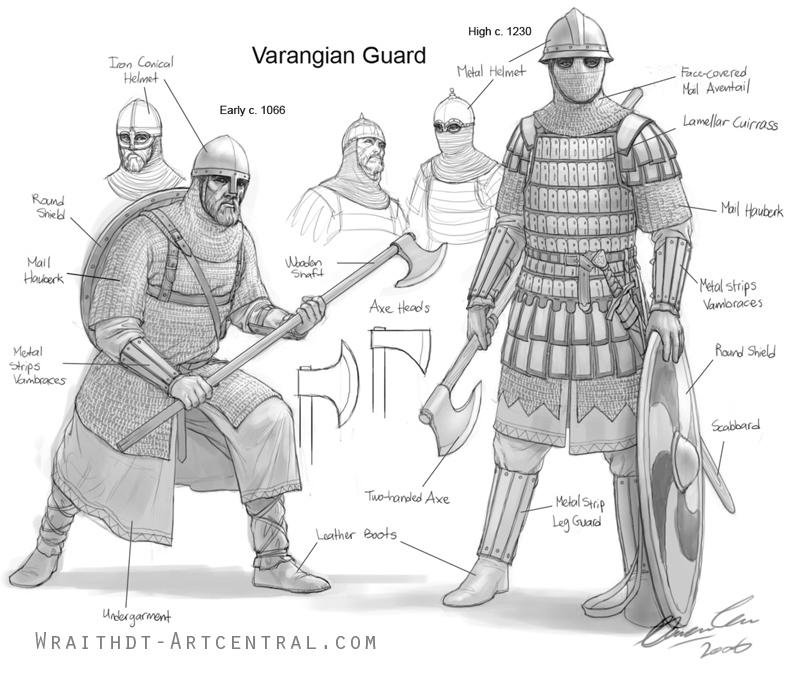 By the 12th century there were so many English that it was commonly being referred to as the ‘Anglo-Varangian’ Guard. As the empire declined, the Varangians also fell on hard times. By the middle of the 14th century they had largely ceased to function and the last mention of them is in the first decade of the 15th century. They appeared relatively late in Byzantine history. In 988, the emperor Basil II, facing a serious revolt, asked the Viking prince of Kiev for some help. In exchange for an imperial bride, the prince sent along 6,000 warriors and Basil was so pleased by their effectiveness that he made them his permanent bodyguard. Their oaths were to him personally- a fact that the court was uncomfortably aware of- and they were housed in the Bucoleon Palace where they could keep an eye on things. Basil made sure they were given a generous salary and he called them ‘Varangians’- literally ‘men of the pledge’. Since they were professional fighters they were the most valuable troops in an army made up mostly of mercenaries or levies. Usually taller and fiercer than their Mediterranean hosts/opponents, they also made good use as propaganda tools to overawe rebellious subjects or frighten opposing armies. In times of peace they could act as a police force in Constantinople or for ceremonial functions. In war they were usually held in reserve until the critical phase of the battle- then sent where the fighting was thickest. Even the Byzantines seem to have been slightly terrified of their berserker rages. The opportunities for wealth ensured a steady stream of recruits, and few returned home empty-handed. At the death of an emperor they had the curious right to raid the treasury and take away whatever they could carry unassisted. Perhaps because of this they gained a reputation for fierce loyalty to the office- but not necessarily the occupant- of the throne. At times the temptations of power were too much to resist and they would lord it over the population of Constantinople- usually in the local wine shops. Their drinking bouts were almost as legendary as their fighting skills and a visiting Danish king in the 11th century was embarrassed enough to publicly lecture them about their behavior. His words do not appear to have had the desired effect. A century later some brave soul referred to the Varangians as the ‘Emperor’s wine-bags’. Did Justinian have Belisarius blinded? Reader Bryan asked what I thought of the legend that Belisarius was blinded by Justinian. 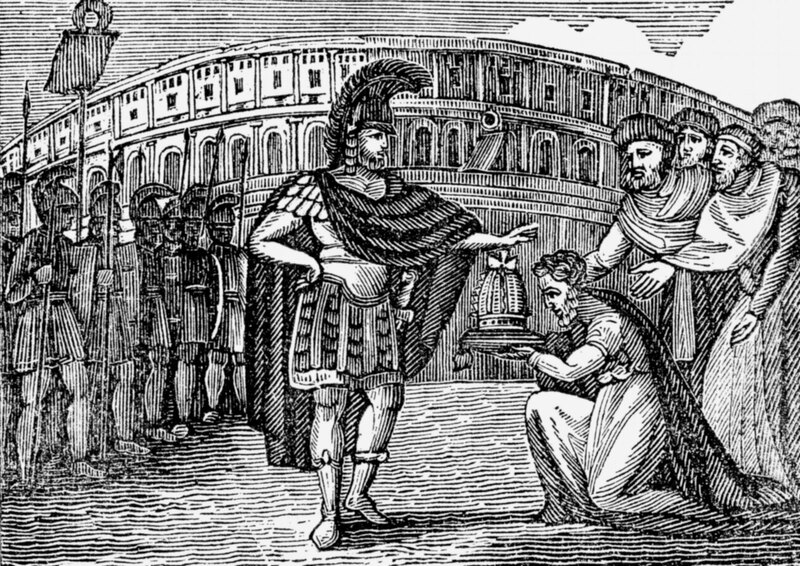 According to the story, a jealous and fearful Justinian arrested Belisarius after his final victory and had him tried for treason. The loyal general’s eyes were put out, his estates confiscated, and he was forced to wander the streets of Constantinople begging for bread while contemplating the vicissitudes of fortune. Some scholars still argue that the legend does have some basis in fact (Justinian was certainly capable of it), but there are several reasons not to accept it. The Crusaders who sacked Constantinople in 1204 mentioned several large statues of Belisarius still standing. Had he been blinded and disgraced these surely would have been torn down. Along the same lines there was also a great cycle of mosaics detailing the victories of Justinian and Belisarius above the gate to the imperial palace. These were made during Justinian’s lifetime and were still in place a thousand years later. Finally, there are the writings of the contemporary historian Procopius. In his ‘Secret History’ he makes no mention of the emperor humiliating his general, despite the fact that he clearly hated Justinian and was trying to blacken his name. He accuses Justinian of being a devil in the shape of a man, of being responsible for the deaths of a trillion people, and of having a head that would routinely disappear- but not of harming Belisarius. What if Urban had built his super cannon for the Byzantines? Reader Patricia asks if the Byzantine defeat in 1453 can really be blamed on ‘modern weapons’ since the Byzantines also had access to them. Was it really a matter of simply not having enough money to build them? I think the Ottomans would have eventually been able to take the city in any case. It was far too exposed, depopulated, completely cut off from friendly Christian powers, and vastly outnumbered. But for all that, it still took 48 days of continuous bombardment. Given the tensions within the Ottoman army and the loss of face associated with each unsuccessful day, would Mehmed have been able to maintain discipline and morale if he had to wait on traditional siege machines? There were already serious challenges to his authority brewing by the time he broke in- and that was with the aid of ‘super’ weapons that could punch their way through walls. Constantine XI was fully capable of rallying his troops and did quite well with his limited forces. It’s always dangerous to speculate but I think he could have held the city against one or two standard Ottoman attempts. So firepower was clearly important, but as Patricia correctly pointed out, it wasn’t just a simple matter of technology. The Byzantines actually did have a few guns- though they were smaller than the Ottoman’s and frequently damaged their own walls with the recoil. What they really lacked was the infrastructure needed to sustain the technology. Enough money couldn’t be scraped up to retain Urban much less pay for the powder, projectiles, and the specialists needed to fire and repair them. 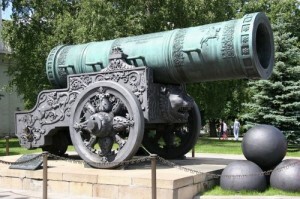 The Ottomans could afford to fully integrate massive new cannons into their army; for the impoverished Byzantines- even if Urban had built his great gun for free- they had to remain a curiosity. 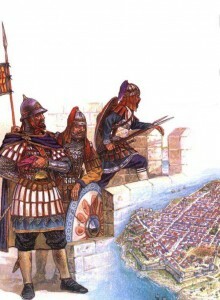 How did the Byzantine army change over 1000 years? Listener Detlef asked if I could give a brief overview of the Byzantine army and describe the changes it went through during the history of the empire. The operative word here is brief but 1.) we’re talking about a millennium and 2.) I’m a former teacher. I’ll try to be concise but you’ve been warned. Nearly every emperor who reigned longer than a few years made some minor changes to the army and a few- Heraclius, Justinian, Basil II, etc- virtually remade it from the ground up. Usually these significant changes were made in response to some crisis or catastrophe, and they give a nice ‘snapshot’ view of how Rome’s legions became the polyglot mercenaries of Constantinople. Imperial Rome depended mostly on massive, infantry-heavy legions to do their conquering for them, but by the third century the borders had stopped expanding and the empire shifted to defense in order to keep those pesky barbarian tribes out. It had a hard time doing this because raids came from multiple fronts and the army could only be in one place at a time. Diocletian solved this by reforming the traditional legions into two parts. “Border” units were stationed in forts along the frontier at various choke points to stop or slow down invading forces while more sophisticated, mobile “field” units could be quickly shunted to trouble spots. About a fourth of these field units were cavalry- somewhat of a novelty for the Romans- both heavily armed cataphracts and horse archers for supporting actions. In total, Diocletian’s armies probably numbered about 300,000, spread out along the eastern and northern frontiers. This basic system remained in place until the fifth century when Justinian reformed the field army. The basic unit was reduced in size to make it more mobile and the army in general began to be much more diverse. In addition to the native troops there were ‘Foederati’- usually barbarian cavalry commanded by a Roman general- and ‘Allies’- groups of Huns or Goths bound by a treaty with the empire to provide service. Unlike the foederati, the allies were commanded by their own officers and fought in their own styles. 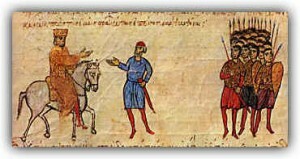 Justinian also reduced the overall size of the army to cut costs. The total strength of the imperial forces at the end of his reign was probably around 150,000 men despite having more than doubled the empire’s land area. In the 7th century pressure from the Persians and the Caliphate caused Justinian’s successors- probably Heraclius or his grandson Constans II- to drastically transform the military. The field army was decreased to about 80,000 men (now called tagmata), and instead of border troops in forts, veterans were settled on frontier land. This was called the ‘Theme’ system and it was remarkably successful. The empire no longer had to bear the cost of border troops, but invading armies still had to contend with experienced, battle-hardened soldiers on the frontier. The Theme system worked so well that the Macedonian emperors were able to go on the offensive and push back the Caliphate. By Basil II’s death in 1025 the field army was probably around 250,000 men, and was far more effective than anything in Western Europe or the Muslim East. Ironically this period also saw the decay of the Themes. Wealthy aristocrats bought up land on the frontiers, and small farmers were increasingly forced out. This process accelerated after Basil’s death and by the 11th century vast estates had replaced soldier communities, completely destroying the Theme system. The empire filled in the gap by hiring mercenaries- an unhealthy habit that was for the moment backed up by the formidable imperial gold reserves. Meanwhile, civil war and political instability destroyed the Bulgar-Slayer’s magnificent field army, reducing it to a collection of militias, personal entourages, and of course mercenaries. By the time the capable Comneni emperors arrived in the 12th century the army was ruined, and they had to start over. Over several decades they trained a professional, disciplined military roughly 40,000 strong, composed of native troops, levies from the various provinces, and foreign units like the Varangians. It was highly centralized and performed well, but it depended on a competent and strong emperor. Under the Angeli this type of leadership was conspicuously absent, and the new army was allowed to decay as the treasury was exhausted in lavish spending. When soldiers were needed, mercenaries were brought in or expensive and humiliating truces were purchased. The loss of Asia Minor led to a shortage of men and the Angeli dependence on mercenaries extended to the near suicidal action of disbanding the imperial navy and trusting naval defense to the Italian sea-Republics of Venice and Genoa. The later Angeli desperately gave land grants in return for military service, but abuse of the practice led to feudalization. Provinces started looking to local strongmen for protection and central authority collapsed. After the 4th Crusade the empire had neither the population to furnish an army nor the money to buy mercenaries, so they relied largely on diplomacy (or a humiliating vassal status) to ward off the coup de grace. When the final end came in 1453, the empire could only muster about 7,000 troops, and a large part of that was the equivalent of Constantinople’s police force. It was a far cry from the 300,000 of a millennium before, but as they so superbly showed, heroism does not depend on numerical strength.